The Facebook group "I hate it when I wake up and Sarah Palin is still alive" has surpassed 3,300 "likes." The founder explicitly says, "This is a page about venting dislike over Sarah Palin. 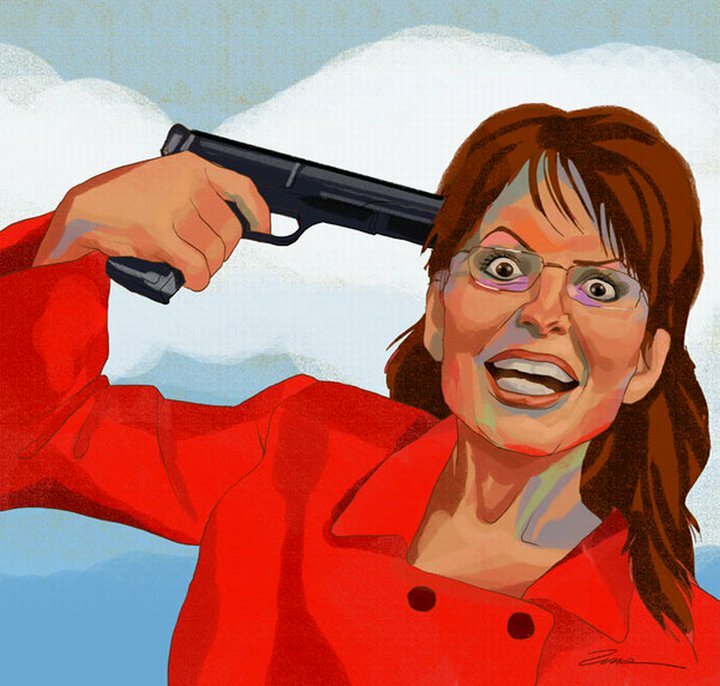 This is no way advocates an assassination of Sarah Palin in any way, shape or form." Further, the group "liked" the Facebook page "I Hate it When I Wake Up and Michele Bachmann is Still Alive." Pundit Press has reported on this hate group before. We had reported it at the time for its offensive use of images and calls for Sarah Palin's death. It's sad, but not surprising, to see that nothing has been done to end such foolishness. This is disgusting! When are we going to see the advocates for the powerless come to Sarah Palin's aid? Yes I know the answer but why is Facebook tolerating this? I suspect that they are silently condoning this atrocious slander! My question to Facebook, in particular to Mark Zuckerman, would you tolerate a Nazi group using your site for their purposes? Hmmm? couldn't agree more with you. perhaps if we started boycotting facebook and those advertisers he will get the message. we know he is in the back pocket of obama the high priest of muslim brotherhood and is a puppet for his socialist agenda. With the way sarah palin is polling high numbers with her unfavorability, I'm sure Facebook and the advertisers won't miss the handful of people boycotting their service or products. And with all of the hateful speech and vitriol Sarah has popularized and advocated since she was plucked put of obscurity about the president, or anyone who disagrees with her, you'd think she would be able to take what she dishes out. Oh, how typical. A 'hater' using Federally defined hate speech to talk about someone who disagrees with them. Note:Stop being a Nazi. Jews aren't all the big hitters now, so are Christians, Muslims, and probably Hindus. You ignoramus. And also it is politically and morally wrong to want to kill someone, even if its in jest. You'll be no better than Stalin, Hitler, or that Sandy school shooter motherf***er. This site is sick people grow up. If it has over 3,300 likes, that means it's gone down. There were 3,436 as of 21 October last year. I agree these people are disgusting and pathetic, but the group itself obviously hasn't grown in months. Okay, so let me see if I have this straight... a site started in May 2010 with 3,300+ "Likers" called "I hate it when I wake up and Sarah Palin is still alive" is bad, while a site started in January 2009 with 785,000+ "Likers" called "I hate it when I wake up in the morning and Barack Obama is President" is good. I wonder who started this whole thing. Try this... go on Facebook and search the terms "hate obama" and compare the number of hits you get on Facebook with a similar search of "hate palin." There is no comparison - the vitriol is evident and pretty lopsided. Please read Matthew 7:3-5 and respond if you like. No one said that hating Obama is good. Ever. Hating is bad, period. Talk about intellectually dishonesty...Hating that BO is still president is a far cry from hating that someone is still alive. Why the Bible Verses? Good point anonymous poster. You are correct..
Stop the hate, it will only lead towards suffering, and this isn't religious or other crap, its something that Martin Luther King taught us. Y'know, the man who supported basic rights and human dignity? In my opinion it a show how one sided Facebook is. My page had been scrubbed many times for being anti Obama yet I've never threatened violence or put up violent pictures. This sight had a picture of a gun to her head and that's ok? Very typical liberal behavior. Well, threatening the life of the president is a criminal offense. Wish ill will on a former politician isn't. Sarah Palin has done nothing but spew hateful, baseless insults about the president on television and Facebook since John McCain unleashed her and a vitriol upon the united states. If you want accuse someone about not basing their statements on facts, try starting with the winner of the Liar of the award about the government trying to kill our grandmothers. They can't hold a candle to her intergrity, or her convictions, so like any good liberal they mock her. these people are a hate group.Sarah Palindid not say you can see Russia from here. Some one on SNL did. There has not been one aspect of Palin's life and career that has not been chewed over, criticized and lied about by her enemies; she has withstood the slings, barbs, bullets, and arrows that would have fallen a lesser person. Soon after Palin entered the national political scene as Arizona Sen. John McCain’s GOP running mate, she was attacked as a diva, a clothes hog, an irresponsible mother and a political mercenary. National broadcasts showed her as being inept and ignorant. At the same time, they dismissed what she achieved as mayor of her hometown, commissioner of the state’s oil and pipeline board and governor of America’s largest state. The media hounded her, and her family, on a daily basis, flat out making crap up (like that she, personally, shot wolves from the air). They claimed her baby was not her own; used despicable language to attack her, and her family; sent numerous reporters to Wasilla to dig up dirt on her ; AP reporters “factchecked” her book; accused her of being an accomplice to murder, her email hacked by the son of a Democrat congressman, political operatives filing endless bogus ethic charges designed to bankrupt a working family with a special need toddler and much more. Obsessive news hounds scrounged through pages and pages of Palin Emails, looking for damning information that could wipe the outspoken conservative from America’s political scene. What they found was the inner workings of an efficient, informed and very involved governor that mounted an unprecedented 80 plus approval rating while in office. Those emails revealed a hard-working, committed public servant. Even the mainstream media has been forced to concede that Palin was a conscientious, transparent, and effective public servant. The media , Hollywood and the REP establishment have done everything they can to vilify Sarah Palin and her family but despite a massive effort to destroy her, she is still on her feet and making a difference in the political world. Sarah Palin hasn't done ANYTHING to create a positive impact on politics in America. The best things she has done was dropping into obscurity after even fox news has had enough of her baseless, toxic word salad. The best thing she can do for the republican party is to leave it whims and let them rebuild themselves from the religious farce it has turned itself into. Sarah Palin has many years (successful) executive management experience at local, regional and state levels including command of the Alaska National Guard and has a history of being a reformer and taking on powerful interests for the benefit of ordinary people. As Govenror, Sarah Palin didn’t just cut spending; she saved, reformed, and prioritized like a good fiscal manager. She invested $5 billion in state savings, overhauled education funding, paid down debt, invested $2.6 billion in an education fund for the future, and funded a Senior Benefits Program to provide support for low-income Alaskan seniors. In stark contrast to President Obama and other governors whose fiscal records are dogged by credit downgrades, Palin left Alaska with an improved credit rating during and following her tenure as governor. Standard & Poor’s raised Alaska’s credit rating from AA to AA+ in April 2008. Then in 2010, both Moody’s and Standard & Poor’s upgraded Alaska to AAA for the first time in the state’s history due to policies enacted by Palin that made the state’s finances more than solvent. Taking on corruption and crony capitalism has always been a cornerstone of Sarah Palin's agenda; in Alaska she did take on the old-boy network — the oil companies and her own party . As oil and gas commissioner, Sarah Palin called out the unethical practices of members of her own party. As Governor, she sought to end the back room deals and improper relationships between oil companies and politicians. After poring over thousands of emails (24,000+ pages of emails) from Palin’s term as governor, even the mainstream media has been forced to concede that Palin was a conscientious, transparent, and effective public servant. After the 2008 election Sarah Palin helped lead Republicans to the greatest congressional victory in several generations during the 2010 election;she has endorsed 73 candidates for the US House of Representatives and Senate; state governors and attorney generals. Her success rate is at 69%. 18 out of 20 targets in her Take Back the 20 campaign ; this is a 90% success rate! Sarah Palin worked tirelessly to forward the commonsense conservative agenda she had always articulated and campaigned with and for those she believed best represented the values she believes are needed in government. And she continues her work to help put government back on the side of the people. Have people forgotten about Palin's crosshairs map targeting 20 Democratic candidates in 2010? It rightfully annoyed Gabrielle Giffords before she was shot and the irony couldn't go unreported. Right wingers are generally NOT nice people and don't deserve a whole lot of sympathy, even if this Facebook particular page goes too far. Do you know the difference between crosshairs and a surveyors mark ? What was actually on Sarah's site, was a map with district markers (surveyor symbols were used). These surveyor symbols were used on the map to indicate districts . Crosshairs are placed on people. Map symbols are placed on maps. It’s a pretty simple concept, really. The media turned surveyor symbols into crosshairs! Anyway, Democrats used election maps with bullseyes on them. Sarah Palin had nothing to do with the shooting, she didn't have any involvement in inciting it, or inciting any violence whatsoever. The shooter was not influenced in any way by Sarah Palin's political opinions.This is truth, clear as day to any objective mind. The shooter is a paranoid schizophrenic who was obsessed with Giffords since 2007. Palin was also fine with the aerial assassination of wolves to further her anthropocentric, Creationist "ecological balance" agenda. We're supposed to feel sorry for this hag? The State of Alaska kill sometimes wolves because the wolves would decimate the herds in Alaska. This is why the Fish & Game Department practices scientific predator control. And no, Sarah wasn’t shooting wolves from a helicopter.